Came across this quality image showing Bredo Feiring and his late teens/early twenties Harley 61" (1000cc). The oilpump is included in the engine timing cover on these early models Harleys. This was later changed to a cover where the oilpump acted as a separate part. 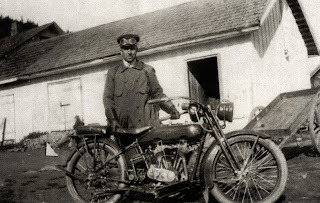 Bredo and his Harley operated in the Hedmark region. The Harley is a magneto model whit full acetylene light equipment by Harley Davidson. Bredo wear a stylish motorcycle riding coat, leather gloves, riding cap and a pair of riding googles. Looking at his riding gear I doubt this guy is the average farmer.